Bulgarian soldiers who took part in crushing the 1968 Prague Spring democracy movement under orders from Moscow bristle at being considered aggressors. "If we were aggressors in Czechoslovakia, having been sent there by the Warsaw Pact, what are our soldiers today who've been sent to Iraq and Afghanistan for NATO?" asks reserve colonel Lyubcho Banov. His irritation is visible as he recalls commanding a company tasked with protecting Prague's Ruzyne airport as the Czech Republic marks the 50th anniversary of the Soviet crackdown. "It was a political decision: it was inconceivable that Czechoslovakia would be allowed to escape. As soldiers we carried out our duty, without firing on civilians," Banov says. "We weren't aggressors." Pencho Valkov, a businessman from the central town of Drianovo, bears a small scar on his chest from where he was scraped by a rebel bullet, fired from a house close to the airport. "I took cover, we weren't allowed to respond to the shot," he recalls. Valkov was just 18 at the time and says he did not know why his unit was being deployed when the soldiers were flown from their base near the Turkish border to the then Soviet republic of Ukraine on July 28, 1968. "We flew very low over the Black Sea, at an altitude of 200-300 metres, to avoid detection by Turkish radar," says Gospodin Chonkov, who led Valkov's unit, tasked with communications. As Romania was the only Warsaw Pact country not to support the crackdown on the Prague Spring, the troops also had to avoid Romanian airspace. Chonkov says the men were "surprised" to arrive in western Ukraine. There they were awakened at dawn on August 21 and told of their mission just before re-boarding their plane. "A commander explained that our 'Czechoslovak brothers' had asked for help, that it was 'worse than a war'," Valkov recalls. Those who were scared of the mission were invited to make themselves known, but no-one dared. When they arrived at Prague's Ruzyne airport, the Russians were already there. The Bulgarian troops took control of movements at the airport and quickly dug trenches around the perimeter. Information reached them through a newspaper printed in Bulgarian called the "Ruzyne Guardian". Relatively isolated from the dramatic events in the city of Prague itself where Soviet tanks rolled down the streets, the Bulgarians saw some signs of hostility -- although they maintain that the local population was generally positive towards them. "There were young people protesting at the airport entrance with banners in Russian reading 'Idite domoy!' ('Go home! ')," Chonkov says. "It was the first time we had seen a civilian protest." On September 9 one Bulgarian was found dead. His fellow soldiers never learned the exact circumstances of his death. The soldiers experienced few qualms about their mission, during it or afterwards. "We were convinced by the propaganda, we thought we weren't fighting against ordinary people but against those who wanted to split Czechoslovakia off from the socialist community," says Chonkov. They received a hero's welcome on their return to Bulgaria and were given three days' leave. Those who wanted to were given the opportunity to go to university without sitting the normal entrance exam. Despite the international condemnation the crushing of the Prague Spring attracted, Chonkov insists: "We never fired on any Czechs". 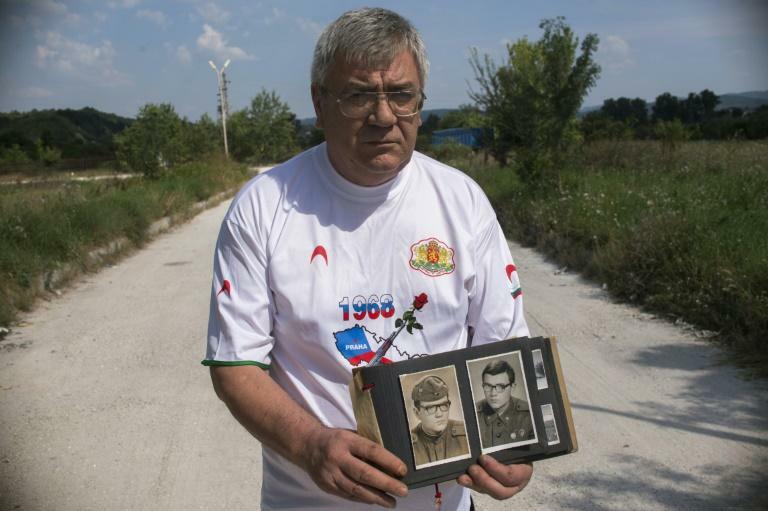 For the 40th anniversary of the operation in 2008, Chonkov held a reunion for a dozen of his old comrades and had T-shirts made for them symbolising their self-image: a Kalashnikov with a rose -- Bulgaria's national flower -- emerging from its barrel.